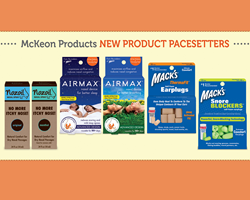 McKeon Products, Inc. leads the way with several new product launches supporting wellness and vitality, including their new Nozoil® Nasal Spray and Airmax™ Nasal Device. Nozoil® Nasal Spray, Airmax™ Nasal Device, Mack’s® ThermaFit™ Ear Plugs and Mack’s® SnoreBlockers® Ear Plugs from McKeon Products, Inc. These results substantiate McKeon’s new product launches, as Nozoil®, Airmax™, ThermaFit™ and Snore Blockers® provide many of these wellness attributes. IRI’s New Product Pacesetters report shows that the leading health and beauty products are those supporting wellness and vitality. 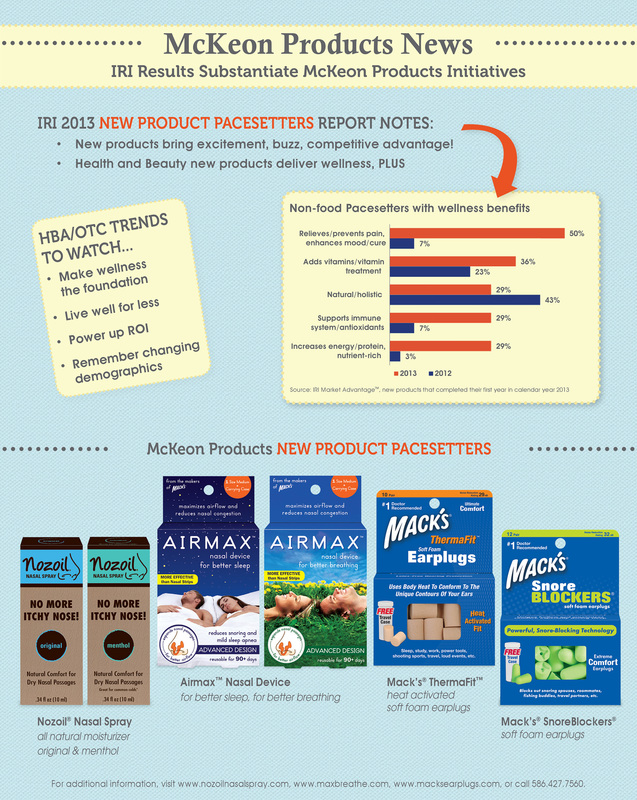 These results coincide with recent new product launches by McKeon Products, Inc. McKeon has recently introduced Nozoil® Nasal Spray, a revolutionary nasal spray that provides natural comfort for dry, itchy nasal passages. Their Airmax™ Nasal Device, also recently introduced, is a clinically proven endonasal medical device that increases airflow through the nose, providing a simple and effective solution for individuals who have difficulties breathing while sleeping or as a result of colds and allergies. Unlike traditional foam earplugs, McKeon’s new Mack’s® ThermaFit™ Earplugs’ unique design utilizes body heat to enhance performance, providing ultimate comfort while reducing noise levels by 29 decibels. McKeon’s Mack’s® SnoreBlockers® have a unique, hollow end that maximizes comfort, especially during sleep. This powerful, snore blocking soft foam earplug blocks out 32 decibels of noise, ensuring peaceful, quiet rest. IRI’s report notes that the following product benefits are extremely important to consumers and their wellness: relieves or prevents pain, provides a cure, enhances mood, increases energy, adds vitamins and antioxidants, is natural, and supports the immune system. These results substantiate McKeon’s new product launches, as Nozoil®, Airmax™, ThermaFit™ and Snore Blockers® provide many of these wellness attributes. Nozoil® is a natural, drug-free solution that moisturizes and conditions the delicate and sensitive nasal passages, providing relief from itchy and burning sensations. This clinically proven formula uses 100% pure sesame oil, rich in antioxidant Vitamin E, which is supportive in reducing the destructive effect of free radicals. Nozoil® helps support the body’s natural defenses, ideal for relieving the effects of allergies, illnesses, and dry environments. The Airmax™ Nasal Device is specially designed to help users breathe more freely through their nose. It is important in helping consumers address nasal breathing difficulties and sleep challenges. Multiple clinical studies have proven its effectiveness in improving airflow, reducing snoring and mild sleep apnea. As the negative effects of habitual snoring can put people at risk for serious health problems, Airmax™ provides a natural solution to relieve breathing and sleeping difficulties. When activated by body heat, the smooth cylinder of the Mack’s® ThermaFit™ forms to the unique shape of the user’s ear canal, providing ultimate comfort and noise reduction. Mack’s® SnoreBlockers® ensure peaceful, quiet rest even when sleeping next to a ‘loud’ sleeper. Both provide a natural solution to protect hearing and block out noise. For over 50 years, McKeon Products, Inc. has led the hearing protection and ear care industry with its Mack’s® brand line of products. Mack’s® provides the #1-selling and original formula Mack’s® Pillow Soft® silicone ear plugs. Mack’s® is the #1 doctor recommended ear plug brand in the U.S., with an extensive variety of ear plugs designed for sleep, travel, music, swimming and overall noise reduction. Mack’s® is the #1-selling brand of ear plugs as well as the official earplugs of USA Swimming®. Today, McKeon Products, Inc. manufactures a full range of health care products for consumers, including hearing protection, nasal care and breathing improvement products. The Mack’s® line of products also includes moldable, pre-molded and foam earplugs, ear drying aids, earwax removal aids, nasal devices, nasal sprays, sleep masks, musicians’ ear plugs, ear muffs, and screen and lens wipes. McKeon, an ISO 9001:2008 quality certified company, is committed to supplying the highest quality, innovative products at a value to consumers.